Artbeat Studio has been and continues to be a viable part of my recovery journey. I began volunteering in 2010 and was accepted into the six month residency program in August 2010. Prior to Artbeat I rarely left my house. If I did it was for medical appointments. I wasn’t speaking with extended family or friends. I was afraid of being judged and stigmatized as a mental illness rather than a person living with mental illness. Getting to Albert Street, going up the stairs, entering the elevator and arriving at Artbeat was a challenge. Artbeat Studio is a creative, safe and supportive environment. In the group of five men and three women I found friends. While there, I wrote and self-published a book of poetry. In accomplishing this goal, one artist did the formatting and another added his own touch to the book as a surprise. For him to add to the book, without my knowledge, speaks volumes of the trust we had gained with one another. We formed a community. In the hallway, between studios, we created a conversation hub. We talked about our day, what was going on, as well as satisfying our natural curiosity about each other’s work. Giving back to where I found self-worth and the freedom of creative expression is my way of saying thank you. While at Artbeat, the Occupy New York movement was going on and that was often the topic of conversation. I was learning how to be a part of a world beyond myself and my home. I spent time in the studios of the others, talking, and felt listened to without judgement or having someone trying to fix a problem. I began setting goals, finding a purpose, and joy in life. 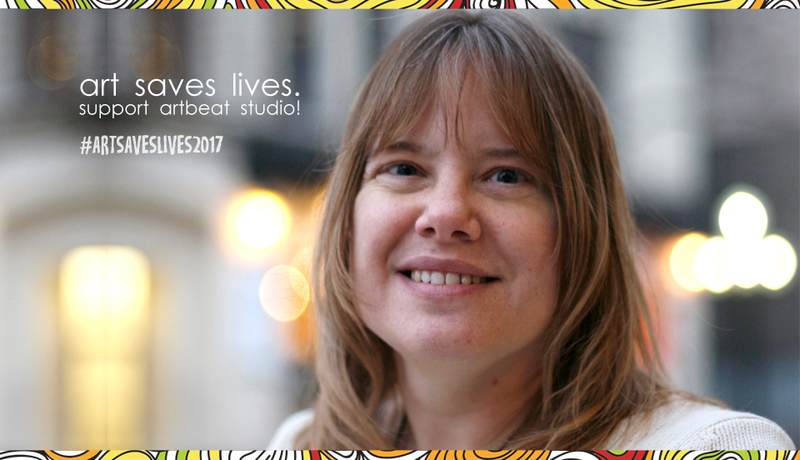 My Artbeat Studio experience began in 2010 and now in 2017, I am volunteering weekly. Giving back to where I found self-worth and the freedom of creative expression is my way of saying thank you. Artbeat has changed my life.